Coenred gripped the hilt of his shield and the hairs on his neck stood up, his common sense screaming at him to flee this place; but he did not draw the mace. Instead he answered. Could you first tell the readers a bit about yourself, e.g. your background and interests? As far as paid work goes, my employment history has been a varied one! After leaving college in 1992 I had a variety of jobs and moved around a lot; I found it difficult to settle till 2000 when I returned to college and studied countryside management. Since then I have been working in various estate keeper/woodsman roles up until last year. I love to be outdoors and the raw sanctuary of nature is a source of great inspiration to me. In particular, I have a great love for rivers and ancient woodland; I feel close to the ‘old world’ in this way. I suppose in a way the great diversity and variety I’ve seen across such varied work has given more to draw on when writing. Outside of work, my main passions are motorbikes and my family. I live with my girlfriend and her two children and my son comes to stay with us often – he’s seven and is already developing a strong interest in Vikings and dragons! Being out on the bike is a wonderfully powerful experience; it has the ability to put the world right as soon as I get on it, no matter what is going on. The bike and its associated world of rallies and meets ties in quite closely with my interest in all things fantasy in many ways and for me that is nice – go to any bike meet and you can guarantee that you will find lots of leather-armoured people sympathetic to the world of dragons and magic! How would you describe your personal writing style and writing method? My methods are not as pre-planned as some. I’ll often be stewing over an idea or a character in my mind while I’m working and it will suddenly come together on the screen when I sit down at the laptop to write. Mind you, I don’t generally plan my work out in detail before I launch onto the laptop – I’ll have a few core notes or names down and the story will evolve around them as I’m typing. I find I am more creative that way; I have always had an extremely active imagination and I need to channel it somewhere so writing in this way works well for me. Who/what are your main inspirations in general, for Ǽrworuld in particular, and why? The desire to write books has always been there at the back of my mind and that comes from my father – he has written several factual books on horticultural subjects and so writing a book or two of my own has always been something I have dreamt of. I know that works of fiction are quite a different thing to their factual counterparts, but it’s in fantasy fiction that my passion for writing really lies. My brother is also a massive inspiration to me; sadly we lost him to cancer almost ten years ago yet it was his death that really helped me begin to get things into order in my own life, in many different ways. He gave me confidence to break down some barriers of self-doubt. He was also a great fan of the fantasy genre and I think he would approve of Ǽrworuld! In terms of inspiration from literature, for me it really all started in the early ’80s with the Fighting Fantasy game book series by Ian Livingstone and Steve Jackson. I couldn’t get enough of those and it was a natural progression for me at the age of about eight into the world of Dungeons & Dragons and beyond. Fantasy authors I like include Robert Jordan, Terry Pratchett and Terry Brooks but I also love to read non-fantasy works by the likes of George Orwell, Ernest Hemmingway, Oscar Wilde and Jack Kerouac! I have to say that I don’t read as much as I would like to (or should do?) but I also draw a lot of inspiration from music; I like a lot of viking-inspired metal such as Leaves’ Eyes as well as Nature-inspired folk/metal such as Jethro Tull right through to the medieval sound of the Mediæval Bæbes. Films are inspirational for me too. An obvious one being the Lord of the Rings trilogy, but also things like the 2010 adaptation of Robin Hood, Beowulf & Grendel, and the Channel 4 film/documentary ‘1066’, to name just a few. This one ‘1066’ is probably my favourite and I like the way it draws strong parallels with a lot of the terminology that we are familiar with in the work of Tolkien; it explains the meaning behind well-known Anglo-Saxon terms such as ‘Elf’, ‘Orc’ and ‘Middle-Earth’ and I like its mixture of feature film and documentary. It’s refreshingly unusual to watch and I think it was the influence of this film that cemented the strong Viking-era influence that can be seen in the Ǽrworuld series. I drew on some experiences in my own life as well as things I have seen and read; this is evident in some of the life of the protagonist in the first book and also in building up the character of the ranger Ælfgar; I drew on my own work amongst nature when I was putting some of his background together.. both he and I have spent happy times hunting for rabbits with ferrets! When did you first come up with the general idea of Ǽrworuld? In what ways has the original concept of Ǽrworuld changed over time and over the course of writing? The first book in the series was borne of a short story that I wrote back in the early nineties. That story was never published but I kept it on the back-burner before developing it into the story we have before us now. In many ways, I think I was subconsciously waiting for life to settle down before I started writing seriously. With everything that life has thrown at me and with all the changes there has been so much to draw on, but I had to find my path in life before I was in a position to really channel any of that into anything sensible. In the original short story, the protagonist had a number of disturbing dreams and experiences and he was left quite insane, completely unable to distinguish ‘normal’ life from this nightmare world he had tapped into. I developed this idea further in the book, this time taking it further and developing it into the fantasy world that we see before us. I wanted to create something a little bit different for the reader in the way that the book flows from our world to ancient world but it was the ancient world, Ǽrworuld, that I wanted to develop as the series went on, rather than the present day world of the protagonist. There was also a tie here between the demons that were attacking him and the ones that invaded the realm of Lorroth in the first book. Some people didn’t get on with this unusual style of writing, but it was fun and I have also had good feedback from it… I think it’s good to try new things sometimes and my writing style has evolved as I myself have experienced more and more of life. Ærworuld is quite clearly influenced by Anglo-Saxons and Vikings. In what ways would you say that these influences shape the Ǽrworuld series in particular, and your writing in general? Do they play any role in your life outside of writing as well? I have an inquisitive nature and not having done any formal study into that period of history I’m having fun stumbling across different things and learning a bit at a time. I am interested in learning more about the pagan and heathen cultures and beliefs of that period, having spent a few years of my own life brain-washed by the Christian ethos in my mid-twenties I am keen to shake free of that and go back to the roots of things. In some ways I can use that experience to better understand the way early Christianity forcibly changed our world back then and I want to tease out some of the ‘Olde Magicks’, if you like. As I work through the series I’m having fun doing a little bit of research into names and so on from the Anglo-Saxon period, as well as other things; in the second book you can find a lot of references to a knörr, which is a particular type of Viking ship. As the series continues I will be drawing on a few other things from that period in our history but I’m mixing it all together into the fantasy world that is slowly evolving; I’m not intending it be a mirror of the past from our own world, I’m just having fun mixing the two. Do you believe that Germanic mythology-influenced literature has become, or is at risk of becoming, over-exposed lately with the production of many fantasy films (such as the “Lord of the Rings” and “The Chronicles of Narnia” tales) and books? Are such stories a current fashion which will die out relatively soon, or do they capture some timeless aspect of the human imagination which is being recognized more broadly by literary circles and the public at large? I think that general-public interest in them has peaked, fickle thing that it is. That said, I do believe there are many people out there, especially in the UK and northern Europe, that feel a real affinity to these cultures as I touched on in my own experiences earlier. These recent films and books have perhaps awoken this love for the old-ways in more of those who are sympathetic to it, adding to the many, many people who have had the passion for it long before the recent exposure. From my personal point of view I don’t think there is over-exposure; I can’t get enough of it, but I do think the genre is becoming flooded to the extent it makes it very hard to stand-out to readers. In which characters of Ǽrworuld do you see a part of yourself? With which one character do you most relate? For me, the obvious one is the ranger, Ælfgar. I drew on a lot of what I learnt working on woodland estates for him. Indeed, his ferret, Otters-Foot, is basically a dead-ringer for one of the ferrets that my good friend Matt and I used to take rabbiting. It’s fair to say that Ælfgar is a lot of what I would like to be! That said, I think I most relate to his brother, Coenred, though; this one has taken a slightly harder road through the rich tapestry of life! Without giving away too much, what can readers expect in the continuation of the Ǽrworuld series? Will the modern-day part of the story from the first book come back into play at some point? Book III is going to see the development of the story of Coenred, as well as the introduction of a few more new characters of course! It is doubtful that we will see a return to the modern world in any of the books yet to come; the stage has been set for the ancient world and I think she is blossoming nicely! What do you hope to achieve with Ǽrworuld as a series and with your writing in general? What are your long-term goals and/or dreams both as a writer and as an individual? For me, the series has achieved so much. I have climbed a really steep learning curve and I think that can be seen in the differences between the first and second book. It has been hard work formatting the books and putting them together, learning to use DTP programs and dealing with artwork… not to mention the website side of things and the nigh-impossible task of promoting a book that an author has published themselves! You could say that the actual writing was the easy part and, in monetary terms, I can never realistically succeed financially on my own – I have no illusions of being the next JK Rowling! But for me the satisfaction of seeing my work in print and in a local bookshop, on the internet and in the library is more than I could have asked for. I am so grateful to close friends and family who have encouraged and supported me through this process. I am aiming to release a book a year, up to the completion of the series with Book IV. I don’t have any other plans for my writing… but you can never be sure! In terms of life goals, I feel really settled at the moment. I have a thirst for knowledge about the old ways, as I spoke about earlier, and the everlasting process of learning is a reward in itself. What advice would you give to other budding authors? Don’t give up. Don’t underestimate your resolve and think long-term, but be a realist – you won’t make your millions in writing but it is unbelievably rewarding to see your work in print. Don’t give up getting the word out… As an answer I give you the words of Games Workshop founder and author Ian Livingstone, when I asked him exactly the same question; “show don’t tell”…. Do you have any final words, thoughts, etc., which you’d like to share with your readers and the readers of this blog? I have really enjoyed the process of creating the series of books set in Ǽrworuld and am still having a lot of fun developing them. All I can hope for is that folks get as much enjoyment from reading the finished works; if you haven’t read the books please give them a chance! Getting the word out there is so, so hard and it’s opportunities like this interview that mean so much to an author in my position. Thank you, one and all! 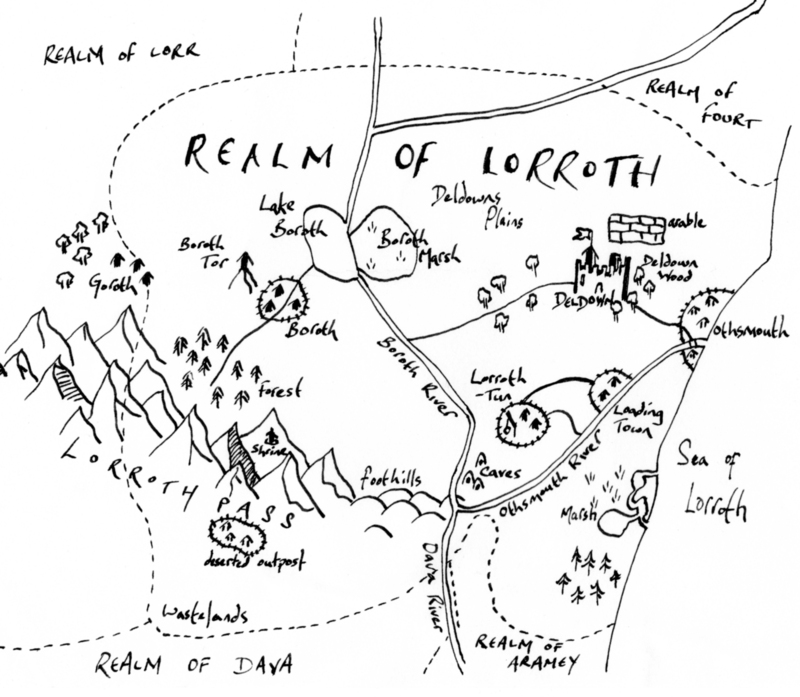 Be sure to visit realm-of-lorroth.com to keep up-to-date with the development of the series! [You can also follow Stuart on Twitter @aerworuld]. This entry was posted in Bōc-Cræft (Literature), Gemōt (Meetings, Interviews) and tagged author, book, Ǽrworuld, fantasy, literature, Stuart Johns. Bookmark the permalink. That’s very interesting, Stuart – I can see you’ve immersed yourself in anglo-saxon culture! Ref. the question about germanic-mythology-influenced films, the one I was looking forward to was ‘The Dark is Rising’ from the Susan Cooper book. The book is loaded with references to Wayland, etc – my first introduction to non-classical mythology. But there’s NONE of it in the film. Pah! Good luck with the series. Have you got your own blog? I don’t have my own blog, but I probably should. I haven’t read the book you mentioned; do you think the film is worth a look for a newcomer to the story? Hi Stuart – spare yourself that film – it’s rubbish and they’ve neatly excised all the mythology! The book is fun, but it is YA.